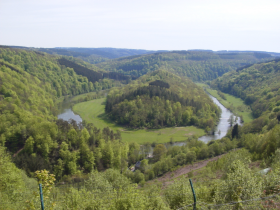 "Tags" for this tour are: driving through unspoiled nature, scenic viewpoints, driving through the valleys of the Meuse (Belgium, France), the Semoy (France) and the Semois (Belgium), small roads through woods and authentic villages, impressive medieval castle. Topped of with the Trappist Abbey of Orval. We leave DINANT for the charming little medieval village and castle of HIERGES, via Freÿr (castle), Waulsort (abbaye), Hastière (romanesque church), Heer, Givet (citadel). From Hierges, we continue to ROCHEHAUT with a breathtaking "helicopter" view on Frahan, via Vireux, Haybes, Fumay, Revin (where we cross the meuse), Anchamps, Laifour, Madagascar (yes, it's the name of this hamlet), Deville, Thilay, Nohan sur Semois, Les Hautes-Rivières, Bohan, Membre sur Semois and Alle. From Rochehaut, we continue to BOUILLON, via Poupehan, Corbion (tobacco museum & workshop - see Wil S. Hylton's article in The New York Times). The highly imposing castle-fortress of Bouillon is one of the most ancient and interesting remains of the feudal period in Belgium. The fortress, whose origins lie in the 7th century, was established by Geoffrey, leader of the first Crusade (1096). It was occupied by the militia until 1830 and was subsequently modernised under the famous architect Vauban. We'll, of course, pay a visit to the castle of Bouillon. If lucky, we'll also assist to the falconry spectacle. Time to leave Bouillon now, for BOTASSART, via Sensenruth and Ucimont, for a magnificent bird eye's view over the "Thomb of the Giant". By then, it will be time to return to Dinant. The way back to Dinant is another 62 km via scenic roads (Menuchenet, Bièvre and Beauraing). For those who want still more, we can extend the tour from Botassart (via Noirefontaine, Dohan, Herbeumont, Chassepierre and Florenville) to the Trappist Abbey of ORVAL, where, after visting the ruins (and museum) of the old abbey, we'll stop at "L'Ange Gardien" tavern for a tasty Orval beer. By then, we'll have about 200 km on the meter, before returning to Dinant (via Valansart, Jamoigne, Les Bulles, Suxy, Grapfontaine, Neufchâteau and the E411), which is another 115 km drive.